Beverly - Martha M. (McLeod) Parmenter 93, beloved wife of the late Read Parmenter, died Sunday, August 26, 2018 at the Masconomet Health Care Center in Topsfield. Born in Malden, she was the daughter of the late Willard W. and Ruth (Scully) McLeod. 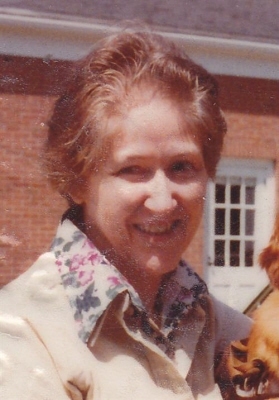 She graduated from Northfield Mount Hermon School class of 1942, attended the Perkins School for the Blind where she learned to be a blind person in a sighted world and earned her degree from Wheelock College class of 1947. She taught for one year in the Springfield school system where she honed her storytelling skills. Mrs. Parmenter had a great love for music, playing the piano and ukulele, and singing in church choirs. In Pembroke, NH, where Martha and Read lived for over 50 years, they raised their daughters Bonnie P. Fleming of Ocala, FL and Beverly and Alice P. Katz (late). At the First Congregational Church, Martha served on many committees, worked on bean suppers and from the mid 1950’s to the 1970’s she assisted Hungarian and Southeast Asian refugee families with their resettlement in the Pembroke area. For Perkins, Martha copied reading materials from one medium to another for blind students. In the late 1970’s Martha qualified for her first of five Seeing Eye dogs, Angie, followed by Jinger, Norma, Waltz and Rosie. Wherever she lived or travelled she shared stories and educated groups of children about guide dogs. Martha believed she was blind, not handicapped. In 1999 Martha and Read moved to Beverly to be closer to family, joining the Second Congregational Church where she sang in the choir and made bread for communion and other services. She also joined the Beverly Council on Aging, volunteering with the Knitting Group, knitting thousands of baby hats for Beverly Hospital. She was a loving mother, grandmother, great grandmother, sister and friend who will be missed by all who knew her. Martha’s favorite Bible verse was John1:1, “In the beginning was the Word, and the Word was with God, and the Word was God.” She is survived by her daughter, Bonnie Fleming of Beverly and Ocala, FL, son in law Eugene Katz, three grandchildren, Brian Katz, Stephanie and her husband Josh Gillman and Adam Katz and his wife Jen, and a great grandson, Jackson Katz, two sisters, Molly Hill of Charlottesville, VA and Patsy Leeming of Lynchburg, VA and numerous nieces and nephews. She was also the sister of the late Willard W. McLeod Jr. The family would like to thank the staffs of Masconomet Health Care and Care Dimensions for their loving and compassionate care of Martha. Her celebration of life will be held at the Second Congregational Church UCC, 35 Conant Street, Beverly, Saturday, September 8, 2018 at 11:00 a.m. Relatives and friends are invited to attend. Contributions may be made in her memory to The Seeing Eye, P.O. Box 375, Morristown, NJ 07963, (973) 539-4425, www,seeingeye,org. Information, directions, condolences at www.campbellfuneral.com. "Email Address" would like to share the life celebration of Martha Parmenter. Click on the "link" to go to share a favorite memory or leave a condolence message for the family.